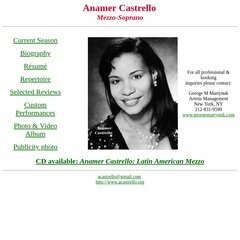 Topics: Current Season, Biography, Résumé, Selected Reviews, and Custom Performances. Age: It went live on August 1st 1998, making it over 19 years, 8 months old. Pair Networks (Pennsylvania, Pittsburgh) is the location of the Apache/2 server. There are 2 Nameservers, ns64.pair.com, and ns0.ns0.com. Acastrello.org's IP address is 209.197.106.131. PING (209.197.106.131) 56(84) bytes of data.